The environment got an early gift this holiday season. The Obama Administration has just released an update to an Executive Order first developed in 1999 on safeguarding the nation from the impacts of invasive species. If you’ve ever lived in Florida, like I used to, you’ve seen the danger of invasive species first-hand. Whether it’s the nasty bites of fire ants, or the incessant need to control weedy invaders that threaten to overtake the landscape, or the menace of invasive snakes in the Everglades, invaders interfere everywhere. Florida is just one of the many places around the U.S. where it’s hard to ignore the impacts of invasive, non-native species on everyday life. If you are a farmer or a rancher or enjoy fishing or boating or birdwatching, invaders can be an expensive problem, a health threat, and a substantial inconvenience. Invaders cost the U.S. billions of dollars annually and pose significant threats to our health and livelihoods. As a plant ecologist, I started by learning where these non-native species are coming from. They can arrive accidentally – as hitchhikers on other imports or the packing material those imports are shipped in – or purposely – for food, ornamentals, pets, or other uses like erosion control. 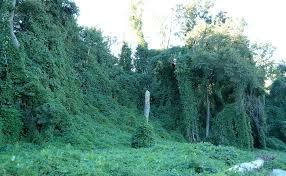 My investigation into plant invaders showed that the vast majority – perhaps 90 percent – were purposely introduced. That information led me to focus on how we might prevent the introduction of new invaders, through risk analyses and other methods. Over the years, our ability to identify the likely bad actors – whether they are plant, animal, insect, or disease – has really improved. That brings me back to the updated Executive Order. The main emphasis of the original Executive Order was to ensure coordinated action among the federal agencies to prevent new invaders and control existing ones, as well as to work in partnership with the private sector to achieve these goals. In addition to reinforcing and strengthening the original intent of the Order, this update emphasizes that human and environmental health need protection, and that those efforts will be impacted by climate change. 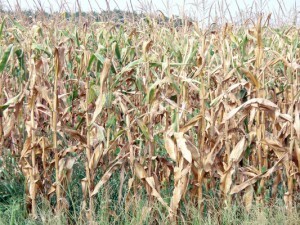 The updated Order also recognizes that the need to seek and take advantage of technological advances for both prevention and management or control of invaders. The updated Executive Order was announced on the same day that an Innovation Summit on new potential options for addressing invasive species was held. I had the chance to attend that summit. In addition to hearing about approaches to control species ranging from fish to plant and human diseases (including some very cool new methods for detection and control), presenters discussed how to incentivize innovation around this issues. Summit presentations showed that the advances called for in the updated Executive Order are emerging, providing an optimistic outlook for all of us concerned about this issue. Because invaders don’t respect property boundaries and don’t stay put, we need everyone to join the effort to stop their import and movement. News of the Zika virus in the U.S., carried by a non-native mosquito that also carries at least four other diseases, is a clear indicator of the need to take aggressive action. So the Obama Administration’s decision to update the Executive Order is a great holiday gift for all of us. We have even more information this week about the ways climate change poses a threat to human health. The U.S. 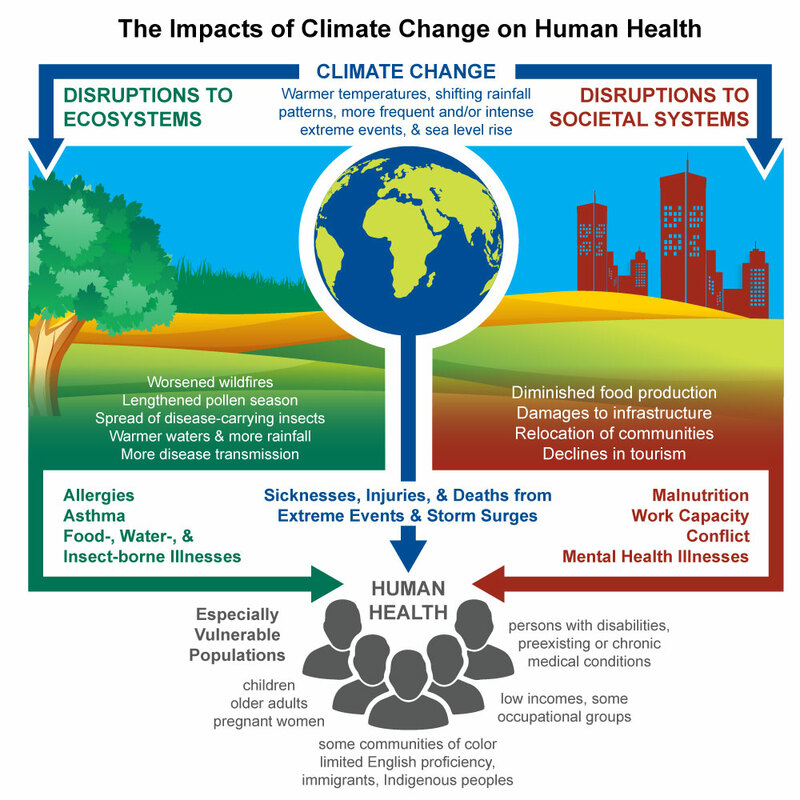 Global Change Research Program just released its newest report—The Impacts of Climate Change on Human Health in the United States. This scientific assessment is the culmination of three years of work by hundreds of experts, and builds on the more general National Climate Assessment released in 2014. The report concludes that every American is vulnerable to the health impacts associated with climate change. Scientists have known for decades that climate change threatens human health via excessive heat, worsened air quality, water related illnesses, food safety, diseases transmitted by pests like fleas and mosquitos, and mental stress. The new report thoroughly characterizes our current understanding of these impacts. Because scientific understanding has advanced significantly in recent years, the authors also reviewed new information and insights from several recent scientific, peer-reviewed publications and other publicly available resources. For example, new data revealed that the Ragweed season has grown by as much as 27 days in the central U.S. from 1995 to 2011, and the incidence of Lyme disease in the Northeast has doubled from 2001 to 2014, both consistent with warming trends. Recent modeling studies have also improved quantification estimates of and confidence in projected health outcomes from climate change. By midcentury, scientists project that there will be as many as thousands of additional ground-level ozone (smog) related illnesses and premature deaths, and the majority of the western U.S. will have a 500 percent increase in the number of weeks with risk of very large fires. By the end of the century, scientists project that there will be an additional 27,000 summertime heat-related deaths annually in over 200 U.S. cities (that are currently home to 160 million people), and harmful toxin-producing algal blooms could develop up to two months earlier and persist for up to two months longer. Overall, the report is a sobering portrait of the risks we face because of climate change — and it underscores the urgency for climate action. The regions that the Zika virus outbreak has struck hardest, such as Brazil and Colombia, also happen to be areas that are currently plagued by hotter-than-usual temperatures. So is there a connection? The ways that virus-carrying mosquitoes change their behavior with warmer temperatures may, in fact, point to a link between the Zika outbreak and climate change like the one that exists with malaria, Lyme Disease and other ills. Female mosquitoes require blood meals for reproduction. Along with many cold-blooded animals, mosquitoes feed more frequently with higher temperatures. The more they eat, the likelier they are to get infected and spread the disease. A virus must incubate inside a mosquito before the mosquito becomes infectious. That takes about 10 days, roughly a mosquito’s lifespan, so the mosquito will often die before it can spread the disease. 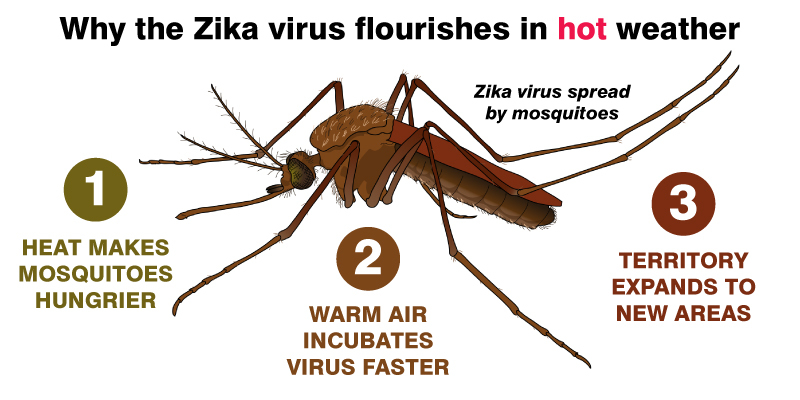 But hotter temperatures speed up the incubation process in the cold-blooded mosquito, because the virus can replicate faster. This means that the mosquito will be alive longer while infectious, thus having more time to transmit the disease. Mosquitoes flourish in warm climates, restricting their range based on temperature. But with climate change, plants and animals are moving northward and upward, and we know mosquitoes do the same as new areas become warmer and a suitable habitat. As mosquitoes expand their range, they can introduce diseases to populations that otherwise would have been safely out of reach. The distribution of the Zika-carrying mosquito, in particular, has wildly increased over the past few decades, which have also been the hottest decade on Earth in more than 1,000 years. In fact, the current epidemic took off in 2015, the hottest year in South America and globally since record-keeping began 136 years ago. The links between mosquitoes and temperature are scientifically clear, and it’s possible that climate change may now be playing a role in the spread of the Zika virus, a disease suspected of causing serious birth defects. To know for sure, and to help nations deal with the outbreak, more research is needed to tease out the specific causes of this global catastrophe. This post originally appeared on our EDF+Voices blog. Achieving high yields requires enabling farmers all over the world to adapt, build and restore the resilience of agricultural ecosystems in the face of continued climate change. 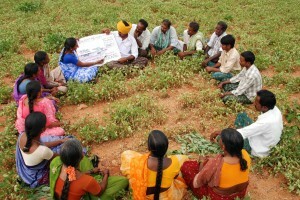 Given that many farmers in developed countries have already reached what are currently maximum possible yields, it’s particularly urgent to work with farmers in the developing world.A vast majority of these farmers in developing countries own small-scale farms (less than two acres in size) and have limited resources, and as a result are on the frontline of experiencing the unfolding impacts of climate change. These farmers are already growing the majority of the world’s food – more than 90% of the world’s rice, over 65% of its wheat and 55% of its corn. Notably, as opposed to our recommendations for farmers in the developed countries, some of them might need to increase their fertilizer use to achieve better yields as opposed to decreasing it. Feeding a world of 9 billion thus requires facing the disproportionate effect that climate change has on the 2 billion people who depend on small-scale farms for their livelihood. 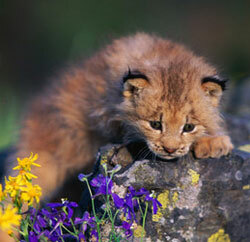 The Canada lynx is at risk because of changes to the snowpack caused by climate change. With the political debate heating up over the American Clean Energy and Security Act, it’s easy to lose sight of what the fight is about. Yes, this is about people and jobs and freeing ourselves from foreign oil and creating a clean energy economy for the 21st century. But it’s also about our natural heritage and the wildlife with which we share this planet. Species from blue whales to butterflies confront growing threats. Their habitats are rapidly changing along with the climate. Global warming is pushing nature to the brink. That’s why we launched a new campaign, Warming and Wildlife, where we document the story through the prism of seven “ambassador species” from across America already struggling to survive. Without action, there’s a good chance these species won’t make it — we could lose them in our lifetimes. The bumper sticker is right: Extinction is forever. But, it doesn’t have to be inevitable, not if we each do our part to cap America’s global warming pollution and unleash the clean energy economy of the 21st century.